Not all recommendations for Medals of Honor from the Pine Ridge Campaign of 1890-1891 were approved. Lieutenant Hale was one such example of a recommendation for a Medal of Honor that was disapproved. In the case of Captain Fechét, the recommendation for his actions to rescue the Indian police besieged in Sitting Bull’s camp following that chief’s death was viewed by the Commanding General of the Army as not worthy even of honorable mention in general orders. 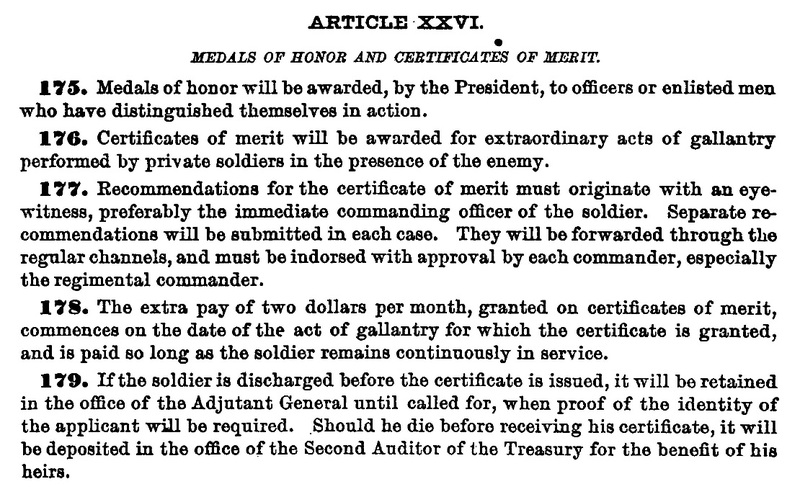 In the 7th Cavalry Regiment, there were at least two recommendations for Medals of Honor that ultimately were approved for lesser recognition. During the fight on 30 December 1890 near the Catholic Mission on White Clay Creek, Captain W. S. Edgerly and his troop were in a precarious position while his battalion was attempting to withdraw from the field. Lieutenant W. W. Robinson several years later described the situation, in which G Troop suffered that day’s only fatality among the U.S. troops. It seems now that the retirement of the 1st Battalion encouraged the Indians in the belief of their strength, and caused them as the 2nd was about to retire, to make quite a vigorous attack upon its left flank. Just as I mounted my horse to retire with the line, I found myself quite fully exposed to the fire of, as I judged, about a dozen Indians on the hills to our left and front, and by one of these shots, Private Clette [sic: Franceschetti] of troop G was killed about ten feet from me. It likely was during this stage of the engagement that two troopers took the initiative. G Troop was apparently in a defilade position, somewhat protected from the Indians’ direct small arms fire. This also meant the troopers could not put direct fire on the Indians. Sergeant Emanuel “Gus” Hennessee and Private Frank Mahoney moved up in front of the skirmish line to the crest of the ridge covering the unit, exposing themselves to the shots of the Sioux Indians firing on the retiring formations. The two soldiers remained in that exposed position for at least ten minutes, each man “doing good service with his carbine,” according to their commander. It was the sergeant’s twenty-seventh birthday. In March 1891, Captain Edgerly recommended four of his troopers each be recognized with a Medal of Honor, First Sergeant Toy and Private Hamilton for actions at Wounded Knee, and Sergeant Hennessee and Private Mahoney for actions at the Mission fight. 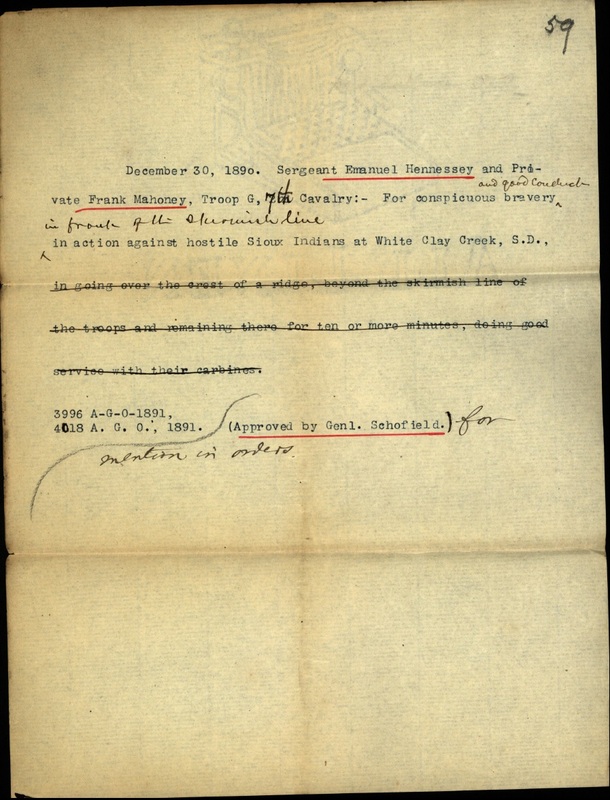 (Click to enlarge) Two letters written by Captain W. S. Edgerly, commander of G Troop, 7th Cavalry, recommending Medals of Honor be awarded to Sergeant Emanuel Hennessee and Private Frank Mahoney. These two recommendations are a unique example of the awards process within the War Department in 1891. Captain Edgerly wrote both letters on 18 March. As with several of the award recommendations of the 7th Cavalry that month, the letters were endorsed the next day by the regiment’s adjutant, Lieutenant McCormick, upon consultation with Major Whitside. No mention is made in the correspondence that Colonel Forsyth was on leave and, thus, unable to endorse them himself. McCormick sent the letters by mail from Fort Riley, Kansas, to St Louis, Missouri. Unlike in the case of the E Troop recommendations, where they were all returned to the regiment for additional detail and endorsement by Colonel Forsyth, Major General John M. Schofield felt he had enough information to make a final determination on both recommendations: that Hennessee and Mahoney would receive honorable mention in general orders rather than be awarded Medals of Honor. Schofield signed the endorsements on 4 April. The entire process from the troop and regiment at Fort Riley, through the Department of the Missouri at St Louis and the Adjutant General’s Office in Washington, to the Commanding General of the Army, took just seventeen days. (Click to enlarge) Endorsements on the recommendation of Sergeant Emanuel Hennessee for the Medal of Honor. Unlike in today’s Army, in 1891 there was no 220-page regulation governing the process for awards. There were, instead, just five paragraphs in the Army’s sole regulation, one paragraph for the Medal of Honor and four for the Certificate of Merit. For the Pine Ridge Campaign, Medals of Honor were approved by the Acting Secretary of War, Lewis A. Grant, ostensibly for President Benjamin Harrison on behalf of the Congress. However, General Schofield clearly believed he had the authority to approve a lesser form of recognition in the case of Hennessee and Mahoney, without forwarding the request to the War Department, what, in today’s parlance, would be called downgrading a Medal of Honor recommendation. (Click to enlarge) Draft narrative for honorable mention of Hennessee and Mahoney in General Orders. At the end of 1891, the Adjutant General’s Office circulated drafts of citations for honorable mention to be published in general orders. The original draft for Hennessee and Mahoney contained the verbatim narrative provided in Captain Edgerly’s letters, but was eventually edited down to a more concise write up devoid of detail. The two G Troop soldiers were commended by General Schofield in General Order No. 100 for, “conspicuous bravery and good conduct in front of the skirmish line in action against hostile Sioux Indians, near the Catholic Mission, on White Clay Creek, South Dakota.” The soldiers’ names appeared in newspapers across the country as among those accorded such accolades, but, unlike recipients of Medals of Honor or Certificates of Merit, whose deeds were published annually in the Army Register, those merely receiving honorable mention were soon forgotten. Armies engaged in warfare have for millennia brought men of disparate back grounds together, where they engage as comrades in arms, or enemies, in bloody battle, and then go their separate ways to live lives that, but for combat, would never have intersected. Such it was for Sergeant Gus Hennessee and Private Frank Mahoney. Burton Honey with his second wife, Theresa Gieber Honey. Burton Honey was active in the Grand Army of the Republic in Kansas. Born on 27 March 1861 at Roseville, Illinois, Frank Marian Honey was the eldest child of Burton and Prudence Lucinda (Underwood) Honey. Five months after the birth of his first son, Burton Honey enlisted as a private in the 36th Illinois Infantry Regiment. He was wounded in the battle of Stone River in 1862, and his injuries prevented him from returning to his regiment. He later served as a corporal in the 17th Veteran Reserve Corps, also known as the invalid corps. Following the war, the Honey family relocated to Clyde, Kansas. Prudence bore five boys and a girl, but died in 1875 just months after the birth of her daughter. Burton married Theresa Gieber the following year, and she bore him four daughters and a son. The Honeys moved several times within Kansas from Cloud to Shirley and Strawberry to Ogden. Catherine “Jenny” Mitchell married Frank M. Honey in Manhattan, Kansas in 1885. Ogden was a small town adjacent to Fort Riley, east of Junction City and west of Manhattan, Kansas. It was while at Ogden that Frank Honey met and married Catherine Virginia “Jenny” Mitchell on 12 May 1885 in Manhattan. She was the third of four children of Robert and Martha (Bower) Mitchell, native Marylanders that had settled in Riley County, Kansas, by 1880. In June 1886, Frank and Jenny’s daughter, Ida, was born, the first of ten children, eight girls and two boys. 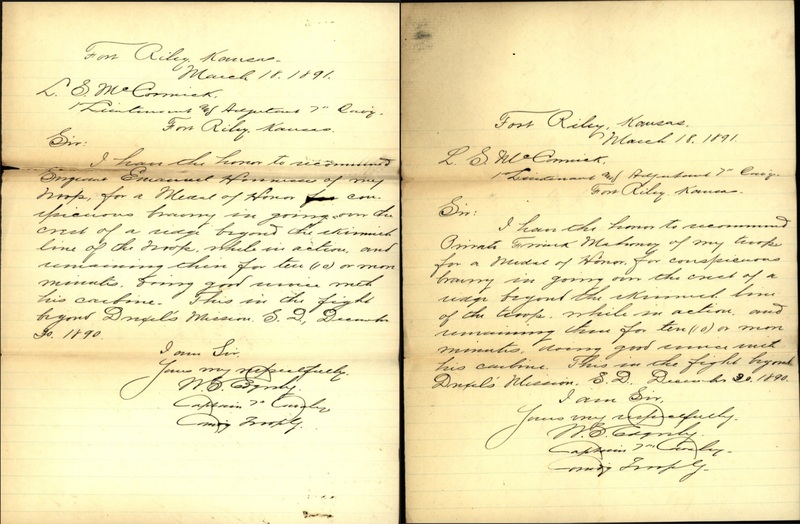 Perhaps seeking a steady paycheck to support his new family, Frank Honey went to Fort Riley on 4 June 1888 and enlisted in the 7th Cavalry. Having a wife and child living in the local area at the time of his first enlistment made Frank an oddity in the Army of his day. It is perhaps this reason that he enlisted under the alias “Frank Mahoney.” Standing five foot nine, he had grey eyes, brown hair, and a fair complexion. Four months later, Frank’s younger brother, George, followed his brother’s lead and enlisted in the 7th Cavalry where he served alongside Frank in G Troop. George also listed his last name as Mahoney. However, he did not participate in the Pine Ridge Campaign in 1890, as he was in confinement at Fort Riley facing a court martial. While Frank went where the Army sent him, Jenny remained in Ogden, where all of their children were born. Frank completed his first enlistment in 1893 at Fort McIntosh, Texas, near the border town of Laredo. He returned to Ogden, where Jenny was raising three daughters; a fourth girl, having died as an infant, was buried in the Fort Riley Post Cemetery. War with Spain brought Frank back to the military in 1898, this time with the 14th Infantry Regiment. He was a corporal in August 1899 when he reenlisted in Manila, Philippines. However, he ran afoul of military discipline and was dishonorably discharged as a private three months later. Frank returned to Ogden where he and Jenny raised their ever growing family. In addition to raising ten children, seven of whom survived childhood, Frank and Jenny also raised at least two of their grandchildren. The middle daughter, Esther, was unable to care for her two children after her first marriage ended in divorce. Frank and Jenny raised their daughter’s kids, Evelyn and Chester, as their own. In 1942, Frank’s eighteen-year-old grandson enlisted in the Army and went to England where he was commissioned as a navigator on a B-17 crew. In July 1944, Frank received word that his grandson, Second Lieutenant Chester B. Stoupe, assigned to the 525th Bomber Squadron, was missing in action; his B-17 and crew disappeared over the North Atlantic on their maiden flight. A month later Frank Marian Honey passed away at the age of eighty-three. He was laid to rest at Fort Riley, not far from his infant daughter who had been buried there fifty-four years earlier. His wife, Jenny, died eight years later and was buried next to Frank. Frank, Jenny, and their infant daughter are buried in the Fort Riley Post Cemetery. Corporal Emanuel A. Hennessee, Sr., C.S.A., is buried in the Gilboa Methodist Cemetery next to his wife, Elizabeth, in Morganton, North Carolina. Emanuel Augustus Hennessee, Junior, was born on 30 December 1863, at Morganton, North Carolina. His father, “Manuel” Hennessee, Sr., then serving as a corporal in Company D, 11th N. C. Regiment, was able to return home on furlough the following month to meet his namesake before returning to his regiment in February. Manuel Hennessee had married Elizabeth Caroline Johnson in March 1854, and Emanuel, Jr., was their second son and sixth child. After serving in his regiment for over two and a half years, Corporal Hennessee’s luck ran out when he was shot in the head at the battle of Jones’ Farm during the siege of Petersburg. His comrades carried him from the field certain that the ghastly wound in his forehead was fatal. Miraculously, Manuel Hennessee survived his wound, and after months in a Richmond Hospital, he returned home to his family in Burke County. He was handicapped for the rest of his life, partially deaf and dumb, and paralized on one side of his body. Following the war, Manuel and Elizabeth had four more boys, but unable to provide for his family, the Hennessees struggled in poverty raising their ten children, all of whom survived to adulthood. Elizabeth Hennessee died in 1889 when her youngest was fourteen. The combat disabled Confederate veteran survived the war by four decades, dying in 1903. At the age of nineteen, the younger Emanuel “Gus” Hennessee, had located to Cincinnati working as a farm hand. He decided to join the Army. His recruiter was Captain Edgerly, his future troop commander. Hennessee indicated he was sixteen, three years younger than his actual age; he likely had permission from a guardian to enlist under the age of twenty-one. He stood five feet seven inches, had grey eyes, brown hair, and a fair complexion. He was a bright young man and quickly earned his sergeants stripes. Hennessee enlisted again in Troop G in 1888 at Fort Riley, still a sergeant, the same rank and position he held at the Wounded Knee and White Clay Creek fights in December 1890. About the time he and Frank Mahoney were being recognized for honorable mention in general orders, Gus Hennessee left the Army early under an 1890 provision. He took a two-and-a-half-year break from the military and began studying medicine at the U. S. Grant University in Chattanooga, Tennessee. In 1885, Hennessee enlisted again indicating his profession as a student and went on to serve in the Hospital Corps and the 1st Artillery. He served a final enlistment, again with D Battery, 1st Artillery, leaving the Army for the final time in September 1899 at Jackson Barracks, Louisiana, with the rank of sergeant and an ‘excellent’ characterization of service. (Click to enlarge) Dr. E. A. Hennesse in front of his home, The Aerie, in Glen Alpine, N. C., circa 1910. In 1892 during his break in military service while studying in Chattanooga, Gus Hennessee married Mary “Mollie” Emily Merritt of Carter County, Tennessee. She was the twenty-four-year-old daughter of James and Mary Ann (Garrison) Merritt. The young couple was blessed with their first child, a daughter, at the end of that year. When the former cavalry sergeant turned student reentered the Army, his wife remained in Tennessee, where she bore him three sons during the 1890s until he returned to that state to complete his medical degree, graduating in 1900. Taking Mollie and their four boys–their first born daughter died of diptheria in 1896–he moved back to his native county, Burke, North Carolina, to begin his medical practice. Passing the medical examination in June 1902 and obtaining his license, Dr. E. A. Hennessee settled into the small town of Glen Alpine, six miles west of Morganton. With the success of his practice, Dr. Hennessee constructed a magnificent home in 1905 for his growing family, by then six boys. Hennessee became one of the more affluent members of the community, and regularly enjoyed the company of the wealthiest family in Glen Alpine, William Darby “W.D.” Pitts, owner of the town’s largest general store. Unfortunately, the relationship soured over a disputed $1.50 bill that the doctor believed one of the Pitts boys owed him; the Pitts believed Dr. Hennessee owed them 50 cents for transportation during a hunting trip. The seemingly trivial matter took on great significance as the two families began feuding. He was the worst beaten man I ever attended. Dr. Hennessey was shot near the left eye, there were two bullet wounds in the left shoulder, a ball had entered the left hip, his lower jaw was fractured in two places, a knife wound on the back of his hands had severed the tendons, a bone was broken in his left hand, his scalp was lacerated to the bone in 14 places, the left ear was cut and bruised and his right ear was hanging by a shred of skin. Just as his father, Corporal Manuel Hennessee, miraculously recovered from a near fatal head wound in the Civil War, Dr. Gus Hennessee rallied back from his grievous injuries. When Gorman Pitts succumbed to his wounds a month later, Dr. Hennessee was arrested for murder. His trial was delayed until August that year in order to allow him to more fully recover from his injuries. Just as details of the feud were carried in papers across the country, so too, the trial was front page news. Hennessee gained sympathy in the middle of the trial when word was brought to him that his infant son had died unexpectedly, just a year after the doctor’s first wife, Mollie, had died giving birth to the same boy. The trial was recessed long enough for the doctor to accompany the funeral procession to the graveside. After a week of testimony, Dr. Hennessee was acquitted of the charge of murder based on self-defense. The judge stated that he hoped enough blood had been spilt to quench the feud between the Pitts and the Hennessees. But, that was not to be. Just over five years after the bloodletting in the streets of Glen Alpine, Dr. Hennessee was returning by train on the evening of 31 January. Almost immediately after stepping off the car, a man stepped up behind him and, with two revolvers, shot the doctor ten times in the back and side, seven bullets passing through Hennessee’s torso. Dr. Gus Hennessee was killed almost instantly. Two Pitts brothers were arrested for the murder, tried, and acquitted. Some said the jury applied an “eye for an eye” to the scales of justice. One of the state’s witnesses was immediately arrested after the Pitts trial, when he was identified by two other witnesses as resembling the figure that fired the two revolvers. Aaron Wiseman was later convicted and sentenced to die in the electric chair. However, the eyewitness testimony was so dubious that the governor commuted the death sentence and reduced it to a life in prison. Ten years later a subsequent governor pardoned Wiseman. Dr. Emanuel Augustus Hennessee, was survived by his second wife, nine boys from his first marriage, and son and daughter from his second marriage. His widow was unable to provide for such a large family, and the minor children from the first marriage were sent to relatives, while she relocated to Baltimore with her two children, essentially scattering the patriarch’s family. Dr. Hennessee was buried in the Glen Alpine Cemetery next to his first wife, Mollie. It was the Army that brought Frank M. Honey, the son of a disabled Union veteran, and Gus Hennessee, the son of a disabled Confederate veteran together during the Pine Ridge Campaign of 1890-1891. On the day following Wounded Knee, these two troopers voluntarily stood shoulder to shoulder in a valley near the White Clay Creek, and provided critical suppressing fire from exposed positions on a ridge enabling their squadron to break contact and withdraw. The Commanding General of the Army recognized their conspicuous bravery with honorable mention in general orders, and following their enlistments, the two troopers went their separate ways. They were two men from different backgrounds and different futures who courageously fought together on 30 December 1890 as comrades in arms in the 7th Cavalry. William W. Robinson, Jr., to Brigadier General James W. Forsyth dated 1 March 1896, James W. Forsyth Papers, 1865-1932, Series I. Correspondence, Box 1, Folder 1 – Box 2, Folder 49, The Beinecke Rare Book and Manuscript Libraray, Yale University Library. Adjutant General’s Office, Medal of Honor file for Emanuel Hennessee and Frank Mahoney, Principal Record Division, file 3466, Record Group: 94, Stack area: 8W3, Row: 7, Compartment 30, Shelf: 2. Research conducted by Vonnie S. Zullo of The Horse Soldier Research Service. Jordan Dodd and Liahona Research, comp, Illinois, Marriages, 1851-1900 (Provo, UT, USA: Ancestry.com Operations Inc, 2005), County Court Records, Film # 1377920 – 1377922; Ancestry.com, United States Federal Census (Provo, UT, USA: Ancestry.com Operations, Inc., 2009), Year: 1860, Census Place: Monmouth, Warren, Illinois, Roll: M653_234, Page: 392, Image: 392, Family History Library Film: 803234; Year: 1870, Census Place: Shirley, Cloud, Kansas, Roll: M593_430, Page: 226B, Image: 217927, Family History Library Film: 545929; Year: 1900, Census Place: Ogden, Riley, Kansas, Roll: 498, Page: 11B, Enumeration District: 0110, FHL microfilm: 1240498; Ancestry.com, Kansas State Census Collection, 1855-1925 (Provo, UT, USA: Ancestry.com Operations, Inc., 2009), Topeka, Kansas; 1875 Kansas Territory Census, Roll: ks1875_4, Line: 26; Ancestry.com, Kansas, Grand Army of the Republic Bound Post Records, 1866-1931 (Provo, UT, USA: Ancestry.com Operations, Inc., 2012), Post Name: Manhattan Post No. 271; N. Sharlene Kent, “Burton Honey,” FindAGrave.com (http://www.cemeteryrecordsonline.com/cgi-bin/fg.cgi?page=gr&GRid=64727916), posted 26 Jan 2011, accessed 5 Sep 2016; Janice Reed, “Prudence Lucinda Underwood Honey,” FindAGrave.com (http://www.findagrave.com/cgi-bin/fg.cgi?page=gr&GRid=129813768), posted 24 May 2014, accessed 5 Sep 2016. B. Gieber, “Burton Honey & wife, Theresa Gieber,” Ancestry.com (http://mediasvc.ancestry.com/v2/image/namespaces/1093/media/d3ef8c8a-f86d-41af-9174-2067ba2b9977.jpg?client=Trees&imageQuality=hq&maxWidth=1583&maxHeight=785), posted 17 May 2016, accessed 5 Sep 2016. Ancestry.com, United States Federal Census, Year: 1870, Census Place: Liberty, Frederick, Maryland, Roll: M593_587, Page: 341A, Image: 392837, Family History Library Film: 552086; Year: 1880, Census Place: Grant, Riley, Kansas, Roll: 395, Family History Film: 1254395, Page: 396A, Enumeration District: 262, Image: 0216; Year: 1900, Census Place: Ogden, Riley, Kansas; Roll: 498, Page: 10B, Enumeration District: 0110, FHL microfilm: 1240498. Pennell and Zellner, Junction City, Kan., “Jenne, (Mitchell) Honey,” Ancestry.com (http://mediasvc.ancestry.com/v2/image/namespaces/1093/media/c8884363-8cb7-4570-a317-9e7d92309c99.jpg?client=Trees&imageQuality=hq&maxWidth=1583&maxHeight=785), posted by Lisa Jackson 12 Aug 2012, accessed 5 Sep 2016. Ancestry.com, U.S. Army, Register of Enlistments, 1798-1914 (Provo, UT, USA: Ancestry.com Operations Inc, 2007), Years: 1885-1890, Last Name: L-Z, Page: 109, Line: 320; National Archives and Records Administration, U.S., Civil War Pension Index: General Index to Pension Files, 1861-1934 (Provo, UT, USA: Ancestry.com Operations Inc, 2000), State Filed: Kansas, Roll Number: T288_224, Comments: Indian Wars; Adjutant General’s Officer, “7th Cavalry, Troop G, Jan. 1885 – Dec. 1897,” Muster Rolls of Regular Army Organizations, 1784 – Oct. 31, 1912, Record Group 94, (Washington: National Archives Record Administration). Ancestry.com, U.S. Army, Register of Enlistments, 1798-1914 (Provo, UT, USA: Ancestry.com Operations Inc, 2007), Years: 1898, Last Name: L-Z, Page: 101, Line: 1177; Years: 1899, Last Name: L-Z, Page: 127, Line: 3062. Ancestry.com, United States Federal Census, Year: 1900, Census Place: Ogden, Riley, Kansas, Roll: 498, Page: 10B, Enumeration District: 0110, FHL microfilm: 1240498; Year: 1910, Census Place: Fort Riley Military Reservation, Geary, Kansas, Roll: T624_440, Page: 11A, Enumeration District: 0060, FHL microfilm: 1374453; Year: 1920, Census Place: Junction Ward 2, Geary, Kansas, Roll: T625_533, Page: 10B, Enumeration District:57, Image: 119; Year: 1930, Census Place: Junction, Geary, Kansas, Roll: 702, Page: 3A, Enumeration District: 0005, Image:313.0, FHL microfilm: 2340437; Year: 1940, Census Place: Junction, Geary, Kansas, Roll: T627_1232, Page: 3A, Enumeration District: 31-6; National Archives and Records Administration, World War II and Korean Conflict Veterans Interred Overseas (Provo, UT, USA: Ancestry.com Operations Inc, 2000), Name: Chester B Stoupe, Inducted From: Kansas, Rank: Second Lieutenant, Combat Organization: 525th Bomber Squadron 379th Bomber, Death Date: 9 Jul 1944, Monument: Normandy, France, Last Known Status: Missing, U.S. Awards: Purple Heart Medal, Air Medal; National Cemetery Administration, U.S. Veterans Gravesites, ca.1775-2006 (Provo, UT, USA: Ancestry.com Operations Inc, 2006), Cemetery: Fort Riley Post Cemetery, Cemetery Address: Huebner Road Fort Riley, KS 66442, Buried At: Section I Site 137. L. A. Osborne, photo., “Frank Marian Honey,” FindAGrave.com (http://www.findagrave.com/cgi-bin/fg.cgi?page=pv&GRid=73635413&PIpi=79033251), posted 26 Apr 2013, accessed 5 Sep 2016; Ibid., (http://www.findagrave.com/cgi-bin/fg.cgi?page=pv&GRid=73635414&PIpi=79033191), posted 26 Apr 2013, accessed 5 Sep 2016; Ibid., (http://www.findagrave.com/cgi-bin/fg.cgi?page=pv&GRid=110883482&PIpi=80631262), posted 20 May 2013, accessed 5 Sep 2016. Armantia, photo., “Emanuel Augustus Hennessee,” FindAGrave.com (http://www.findagrave.com/cgi-bin/fg.cgi?page=gr&GRid=14340572), posted 1 Aug 2010, accessed 10 Sep 2016. 28 May 1903), 3; National Cemetery Administration, U.S. Veterans Gravesites, ca.1775-2006 (Provo, UT, USA: Ancestry.com Operations Inc, 2006), Cemetery: Gilboa Meth Cem; Armantia, “Elizabeth Caroline Johnson Hennessee,” FindAGrave.com (http://www.findagrave.com/cgi-bin/fg.cgi?page=gr&GRid=55673521), created 31 Jul 2010, accessed 10 Sep 2016. Ancestry.com, U.S. Army, Register of Enlistments, 1798-1914, Years: 1878-1884, Last Name: H-O, Page: 101, Line: 673; Years: 1885-1890, Last Name: A-K, Page: 200, Line: 564; Years: 1893-1897, Last Name: A-K, Page: 192, Line: 148; Years: 1898, Last Name: A-K, Page: 158, Line: 151; Yearbook Announcement: U. S. Grant University (Athens and Chattanooga, TN: Methodist Advocate Journal, 1893-1894), 63 and 71. 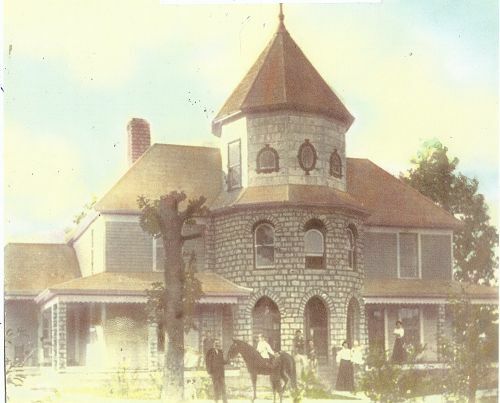 Gene & Dreama Hennessee, photo., “Family Home of Dr. Emanuel Hennessee, II,” The Hennessee Family Genealogy Pages (http://www.thehennesseefamily.com/showmedia.php?mediaID=291&medialinkID=287), accessed 11 Sep 2016. Ancestry.com, United States Federal Census, Year: 1900, Census Place: Silver Creek, Burke, North Carolina, Roll: 1185, Page: 2A, Enumeration District:0017, FHL microfilm: 1241185; Year: 1910, Census Place: Silver Creek, Burke, North Carolina, Roll: T624_1100, Page: 1A, Enumeration District: 0012, FHL microfilm: 1375113; “Sad Death,” The Comet (Johnson City, TN: 17 Dec 1896), 3; Transactions of the Medical Society of the State of North Carolina: Forty-Ninth Annual Meeting Held at Wilminton, N.C. (Charlotte, NC: Osmond L. Barringer, 1902), 277; “Quarrel Over Fifty Cents Began Deadly Pitts-Hennessee Feud,” Charlotte Daily Observor (Charlotte, NC: 11 Mar 1914), 1. “Sad Death at Glen Alpine: Mrs. E. A. Hennessee Passes Away Suddenly on Sunday, Leaving a Large Family,” The News-Herald (Morganton, NC: 1 Aug 1912), 3; “Married,” The News-Herald (Morganton, NC: 2 Jan 1913), 3; “Pistol and Knife Duel: Feud in North Carolina Community in which Seven Men are Wounded,” The Greenville News (Greenville, SC: 19 Jan 1913) 3; “Bloody Fight at Glen Alpine: Dr. Hennessee and Two Pitts Boys Seriously Hurt,” The News-Herald (Morganton, NC: 23 Jan 1913), 3. “Feudists Fined But Old Fight Goes On,” The Carroll Herald (Carroll, IA: 10 Jun 1914), 3. “Gorman Pitts Dead,” Marion Progress (Marion, NC: 27 Feb 1903), 4; “Hardest Fought Case in History,” The Lincoln County News (Lincolnton, NC: 19 Aug 1913), 1; “Dr. E. A. Hennessee Is Found Not Guilty,” The Concord Daily Tribune (Concord, NC: 19 Aug 1913), 1; “Fined and Told to Be Good,” The Lincoln County News (Lincolnton, NC: 17 Mar 1914), 1. “Dr. Hennessee Killed,” The Messenger and Intelligencer (Wadesboro, NC: 7 Feb 1918), 7; “Dr. 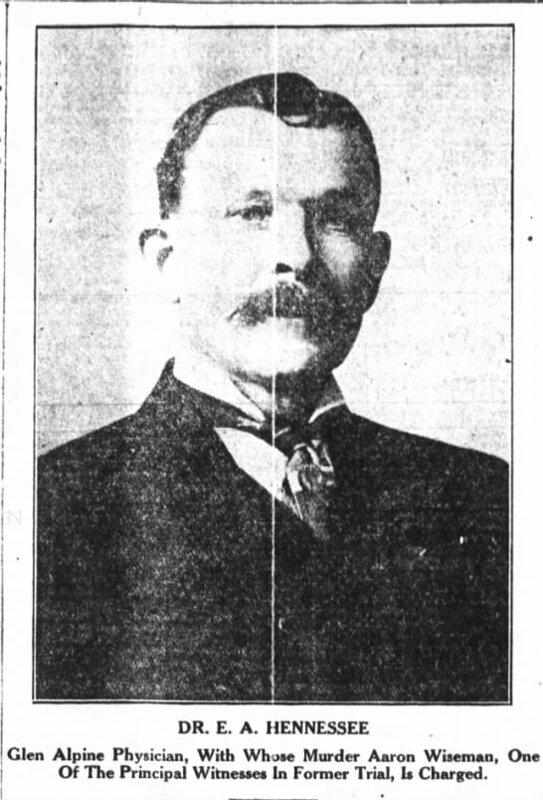 E. A. Hennessee of Burke Killed as He Leaves Train,” Greensboro Daily News (Greensboro, NC: 1 Feb 1918), 1; “‘Not Guilry’ Verdict of Burke Country Jury in Pitts Trial,” Greensboro Daily News (Greensboro, NC: 23 Mar 1918), 1; “Aaron Wiseman Is Charged With Brutal Murder of Dr. Hennessee,” The Asheville Citizen, (Asheville, NC: 18 Jan 1919), 3; “Wiseman Convicted Murder Charge Dies,” The Index-Journal (Greenwood, SC: 29 Dec 1930), 1; Southeastern Reporter, vol. 101 (St. Paul: West Publishing Co., 1920), 629-640. Ancestry.com, United States Federal Census, Year: 1920, Census Place: Lovelady, Burke, North Carolina, Roll: T625_1287, Page: 25A, Enumeration District: 15, Image: 722; Year: 1920, Census Place: Glen Alpine, Burke, North Carolina, Roll: T625_1287, Page: 13B, Enumeration District: 24, Image: 998; Year: 1920, Census Place: Tanners Creek, Norfolk, Virginia, Roll: T625_1900, Page: 6A, Enumeration District:144, Image: 981; Year: 1930, Census Place: Chicago, Cook, Illinois, Roll: 471, Page: 1B, Enumeration District: 2742, Image:619.0, FHL microfilm: 2340206; Nita H. Shepard, “Houk Hennessee Brinkley, Linnie Raye,” The Hennessee Family Genealogy Pages (http://www.thehennesseefamily.com/getperson.php?personID=I1080&tree=hennessee), accessed 11 Sep 2016; Armantia, “Dr Emanuel Augustus Hennessee, Jr,” FindAGrave.com (http://www.findagrave.com/cgi-bin/fg.cgi?page=gr&GRid=7608848), posted 23 Jun 2003, accessed 11 Sep 2016. 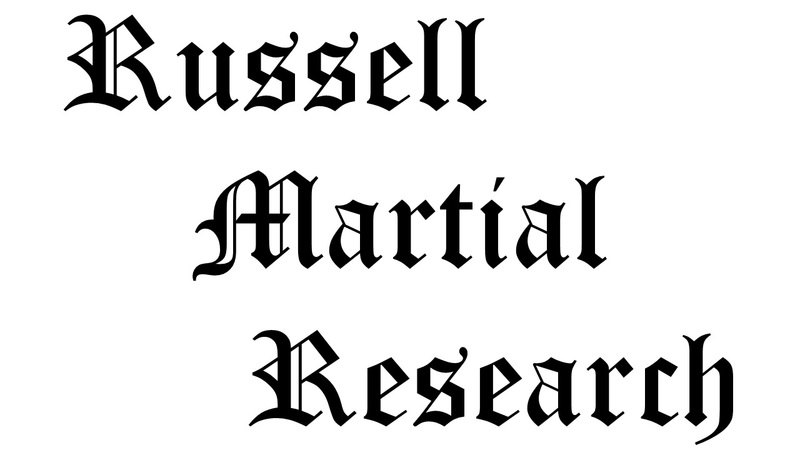 Citation for this article: Samuel L. Russell, “Sergeant Emanuel Hennessee and Private Frank Mahoney, G Troop, 7th Cavalry, Conspicuous Bravery,” Army at Wounded Knee (Carlisle, PA: Russell Martial Research, 2015-2016, http://wp.me/p3NoJy-10d) posted 12 Sep 2016, accessed date __________. This entry was posted in Enlisted, Official Reports and tagged 1891, 7th Cavalry, 7th Cavalry Regiment (United States), Battle of Wounded Knee, Big Foot, Cavalry, Cavalry Troop, Drexel Mission, Fort Riley, Medal of Honor, Pine Ridge Agency, Pine Ridge Campaign, Pine Ridge Indian Reservation, Sioux, White Clay Creek, Wounded Knee, Wounded Knee Creek, Wounded Knee Massacre. Bookmark the permalink. Thanks, Sam. Another fine addition.